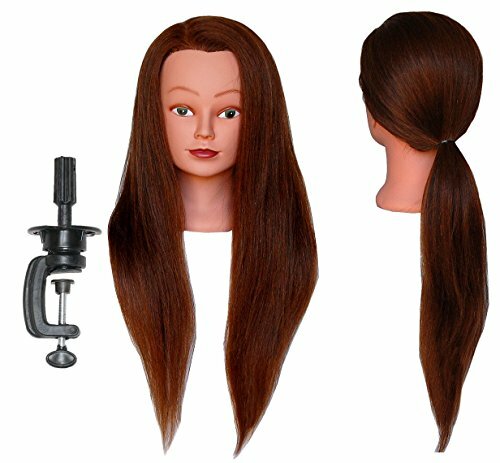 Cosmetology mannequin 100% Top Quality Human Hair (Hair is Soft and Silky) We do not mix synthetic fiber or animal hair to lower the cost and quality on our mannequin. We only deliver the Best Quality product along with Best Value to our customer. Suitable for curling, straightening, bleaching, dyeing, cutting, braiding and hair styling. 100% Pure Top Quality Human Hair (Hair is Soft and Silky) We do not mix synthetic fiber or animal hair to lower the cost and quality on our mannequin. We believe in Quality and Value at the same time. 26 - 28 inches (from the forehead to the back hair end); Individual hair strand: 20 - 22 inches; Color: #4 Medium Brown. If you have any questions about this product by HairZtar, contact us by completing and submitting the form below. If you are looking for a specif part number, please include it with your message.